It’s not very often that we come across something like the Uberscoot 1600w Electric Scooter. The second we saw it, we knew we had to share. Who wouldn’t want a seated 48V electric scooter to cruise around the streets in style? We know we would! With all the recent advancements in technology, it seems like we always hear adults saying, “Don’t you wish they made those when we were kids?” There’s all these new electric scooters, trikes, hoverboards, and so many of them are kids only. When we saw that this scooter was made especially for adults, it was an instant solution to all those complaints. You’re probably wondering how much weight one of these seated scooters can support. I mean, it’s an electric scooter so it might only hold around 150 pounds right? Wrong! We were shocked when we saw that the Uberscoot holds up to 265 pounds! This means that pretty much all riders of all shapes and sizes can use one of these scooters without worrying about breaking or damaging it. Finally, a company recognized that the people buying their awesome toys might actually want to use them for themselves! At 1600w/48v, everything you need is packed into this cruising machine to give you a fun time without breaking the bank (or the scooter). It’s time to embrace your inner youth and hit to the road in style again! If you’re anything like we were when we first saw this electric scooter, you probably thought that the battery life was going to be minuscule. We first thought there’s no way this thing could go longer than a mile since it’s only electric. Most of the latest inventions that last a decent amount of time are gas powered, but the problem with gas is that it pollutes. Impressively enough, the battery life on this electric scooter goes up to 12 miles! We were mind blown that such a small-sized battery compartment could last so long and pack such a punch. Most of the competitors go up to about 2 or 3 miles, which is less than a quarter of this scooter’s distance. Now the charge time must be where it hinges, right? Wrong again! We were excited to see that it only takes 6 to 8 hours to charge this adult scooter. Again, many of the competitors fail in comparison to this one. 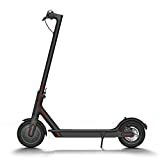 They’re usually rated at about a 12-24 hour charge time, which isn’t too bad, but compared to the Uberscoot it’s far too long. The 1600 watt 48 volt motor on this scooter is more than enough to cruise around town. In fact, it’s strong enough to climb decent sized hills. You won’t be scaling Mt. Everest on this electric scooter, but you won’t find any city streets that can’t be conquered. 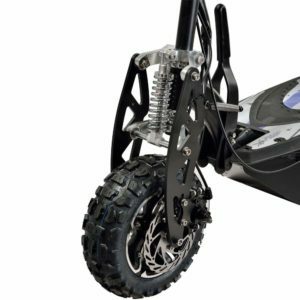 Unlike many other brands, this scooter is no joke when it comes to the motor’s strength and capabilities. Being that the motor is so highly rated, you can also cruise at much higher speeds than other electric scooters. Instead of staying on the slow lane of the sidewalk, you can get to and from basically anywhere around the city in a timely manner. In larger towns and cities, one of these adult electric scooters might be even more efficient than driving a car. You can also use the fuel economy mode to preserve battery life for longer rides, which ensures you won’t be stuck at the side of the road. Easily monitor your battery percentage and always stay on top of how much mileage you have left. No need to panic on those rides, unlike other scooters that don’t really have any battery indication other than the scooter shutting off. One of the best parts about this scooter is that you don’t need to use a drop of gasoline. Gas is constantly polluting the atmosphere, and people are always trying to find ways to make the situation better for our planet. However, riding a bike 5 miles when you’re incredibly tired isn’t always the easiest solution. Luckily, the Ubderscoot requires pretty much zero exertion from you. You simply ride it around like a moped and get to and from your destination without breaking a sweat. Instead of polluting the earth on a boring car ride to work or school, you can cruise up the street with one of these electric scooters. Not only would you be saving the environment, but it’s a much more exciting and interactive ride than in a car. People will probably ask a lot of questions, and who knows, maybe you can recommend it to them and be part of tackling the pollution issue in your local area. Electric scooters haven’t always been the best way to get rid of pollution, but given the charge time and battery life, this one will have no problem taking on the challenge. + Longer battery life and shorter charge time than pretty much any other competitor on the market. This electric scooter wastes no time and gives you all the time you would need to get around town without having to worry about running out of the battery.+ Having an electric scooter is great for several reasons. You can help the planet by reducing gas emissions into the atmosphere, and you don’t have to worry about spending a dime on gas anymore! That’s a pretty good trade-off by anyone’s standards. + Being that the scooter is seated, you don’t have to stand up for the entire ride. If you want to, there’s a base platform that allows you to stand while riding. The choice is up to you, maybe you can mix it up and keep the rides interesting! 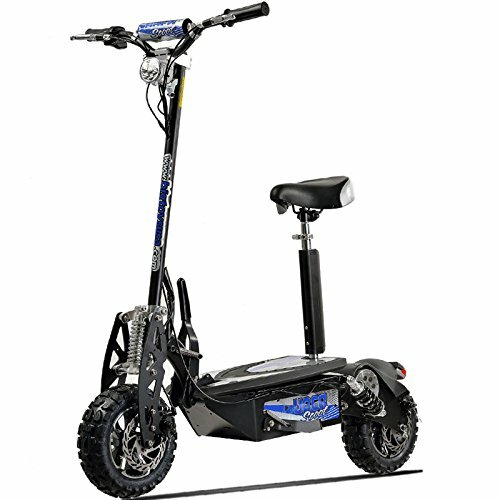 + The 1600 watt 48 volt motor on this electric scooter is more than enough to cover any terrain you’ll encounter within the city limit. Sometimes getting up a hill on a bicycle is a challenge that can really exhaust you, but they’re no match for the Uberscoot. – The 6-8 hour charge time might seem like a lot at first when compared to a laptop or a phone, but you’ll quickly learn to put that in the past when you see how often it doesn’t actually need to be recharged. No to mention that you can simply charge it overnight and be ready to ride again in the morning! 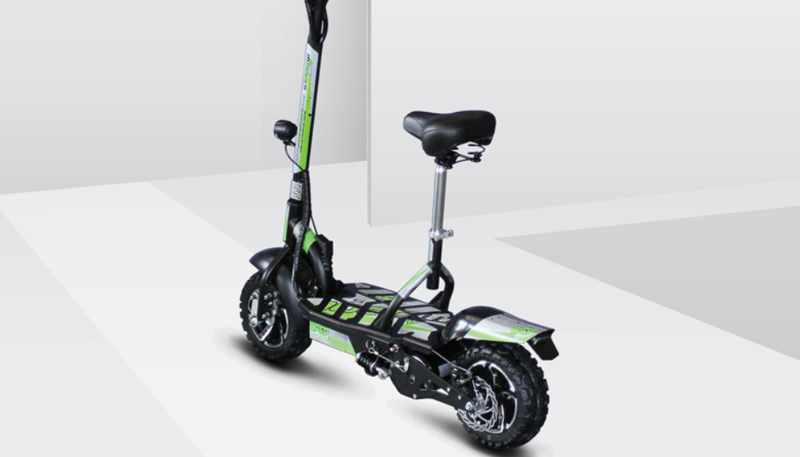 – In many areas, these electric scooters with a motor as large as this one requires that the rider is 18+ years old. However, check with local laws and restrictions to see what they suggest. Some areas only require the rider to be 16, so it’s important to call your city office and figure out what’s best for your situation. The Uberscoot electric scooter is suitable for all kinds of people. Are you looking to take an alternative method to get to and from work or school? This scooter would work for you. Are you looking for a better way to save and preserve the environment and reduce pollution? The Uberscoot can help you fix that issue. Honestly, this scooter is good for anyone looking to have a fun time getting around town. It’s not meant for freeways or highways, so don’t get too crazy, but it’s enough to help you get from point A to point B. Driving a car can be boring and riding a bicycle can make you all sweaty and wiped out before you even start work. We feel like the Uberscoot is a perfect happy middle ground to help you find the best of both worlds. We like this scooter because it brings back the fun things in life that we used to enjoy as kids and combines them with modern needs. Why would an adult use a scooter? Well, now it’s an electric scooter that gets you up to speed and around town to do your errands. It pretty much answers every issue we have with inner-city transportation! We’ve all tried to do that early morning bicycle ride to work, but it’s a little difficult to get the energy in the morning. Save the exercise for after work or during lunch and drive upon what we feel is one of the coolest adult toys around! With thick, traction based tires and a wide platform, you’ll never lose you balance. It’s all about relaxing while enjoying the outside air. When we first came across the Uberscoot 1600w 48v Electric Scooter by Evo Powerboards, we knew immediately that it would be something we’d have to share. It’s one of those unheard of unique inventions that mixes practical transportation with riveting fun. What’s the best part? It’s finally for adults to use! No more buying all the cool stuff for the kids, it’s time you start enjoying technology and having a blast while doing so! to provide a means for sites to earn advertising fees by advertising and linking to Amazon.com, Amazon.co.uk, Amazon.ca, and other Amazon websites.